[S691] United States Federal Census, Washington, District of Columbia, Population Schedule: Liberty, Howard, Indiana;; Enumeration District: 49; Supervisor District: 5; Page: 15, Dwelling: 101, Family Number: 104, Date: 1880. [S915] Works Progress Administration, Howard County, Indiana, Index to Marriage Records 1844 - 1920. Soloman Cox was born on 25 November 1809 in Randolph County, North Carolina. He married Anna Hinshaw on 16 August 1832 at Randolph County, North Carolina. Anna Hinshaw was born on 30 September 1810 in Randolph, North Carolina. She married Soloman Cox on 16 August 1832 at Randolph County, North Carolina. As of 16 August 1832,her married name was Cox. Anna Hinshaw died on 19 April 1887 in Howard County, Indiana, at age 76. James Wesley Bagwell was born on 15 October 1861. He was the son of William Archabold Bagwell and Marie Cox. James Wesley Bagwell died on 17 December 1885 at age 24. He was buried at Greenlawn Cemetery, Greentown, Howard County, Indiana. Milton Archabold Bagwell was also known as Archie Bagwell. He was born on 8 January 1863 in Indiana.1 He was the son of William Archabold Bagwell and Marie Cox. Milton Archabold Bagwell married Dora Belle Olwin, daughter of Jacob Olwin and Salome (? 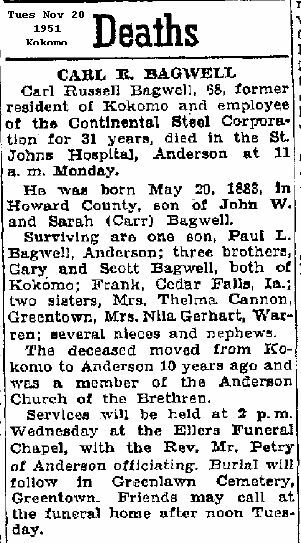 ), on 30 November 1887.1,2 Milton Archabold Bagwell lived in 1910 in Jackson, Howard County, Indiana.1 He died on 22 April 1931 at age 68. He was buried at Greenlawn Cemetery, Greentown, Howard County, Indiana. [S539] United States Federal Census, Washington, District of Columbia, Population Schedule: Jackson, Howard, Indiana; Emuneration District: 144, Supervisor District: 9, Sheet: 6A, Dwelling: 124, Family Number: 124, Date: 1910. As of 24 January 1859,her married name was Bagwell. Sidney Strough married Hugh Washington Bagwell, son of Dovin Hugh Bagwell and Mary Jane Crabtree, on 24 January 1859 at Grant County, Indiana. Her married name was Ward. Wilma M. Bagwell married (?) Ward. Wilma M. Bagwell was born circa 1904.1 She was the daughter of Milton Archabold Bagwell and Dora Belle Olwin. Verna Arlene Bagwell was also known as Arlene Bagwell. She was born on 23 May 1910 in Howard County, Indiana. She was the daughter of Milton Archabold Bagwell and Dora Belle Olwin. Her married name was Kecht. Verna Arlene Bagwell married (?) Kecht after 1930. [S529] United States Federal Census, Washington, District of Columbia, Population Schedule: Jackson, Howard, Indiana; Emuneration District: 34-25, Supervisor District: 6, Sheet: 6B, Dwelling: 158, Family Number: 158, Date: 1930. Delbert Ray Bagwell was born on 28 March 1893 in Jackson Township, Howard County, Indiana.1,2 He was the son of Milton Archabold Bagwell and Dora Belle Olwin.1 Delbert Ray Bagwell married Annie Belle Cohee, daughter of Frank Cohee and Vesta McGraw, on 16 March 1916.1,3,2 Delbert Ray Bagwell died on 17 July 1973 in Greentown, Howard County, Indiana, at age 80. 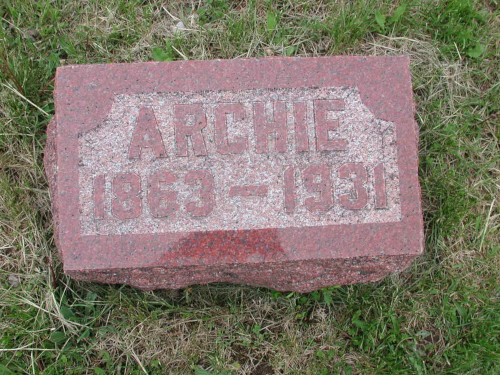 He was buried on 19 July 1973 at Greenlawn Cemetery, Howard County, Indiana. Edwin Russell Bagwell was born on 4 December 1895 in Jackson Township, Howard County, Indiana.1,2 He was the son of Milton Archabold Bagwell and Dora Belle Olwin.2 Private in US Army in World War I. On Dec. 5, 1917, he enlisted in the Quartermaster Corp, of the army at Indianapolis, Indiana, and was first stationed at Fort Thomas, Ky; then at Camp Zachary Taylor, Ky; and before going to France was given special instruction in the Quartermaster Corp, O. T. C., Camp Joseph E. Johnston, Jacksonville, Fla. He reached France in September, 1918, and after the armistice was signed he was sent to Germany with the Army of Occupation. His last assignment was with the 326th F. R. S.
William Merrill Bagwell was also known as Merrill Bagwell. He was born on 12 April 1898 in Jackson Township, Howard County, Indiana.1,2 He was the son of Milton Archabold Bagwell and Dora Belle Olwin.2 He entered the service Oct. 15, 1918, when he was sent to Winona Lake, Ind., where he was assigned to Co; D, S. A. T. C.
On Nov. 23, 1918, he was transferred to the Chamber of Commerce Detachment, Indianapolis, Ind., and discharged Dec. 17, 1918. William Merrill Bagwell married Ruth Irene Kilander, daughter of Frances Kilander and Lettie Ellen Younce, on 16 September 1922.2 Owned Bagwell Coal Company and Speedwash Coin Laundry.2 William Merrill Bagwell died on 16 September 1990 in St. John's Medical Center, Anderson, Madison County, Indiana, at age 92.2 He was buried on 21 September 1990 at Greenlawn Cemetery, Howard County, Indiana. Her married name was Toy. Edna Pearl Bagwell married (?) Toy. Edna Pearl Bagwell was born on 3 September 1900.1 She was the daughter of Milton Archabold Bagwell and Dora Belle Olwin. Edwin Doyle Bagwell was born on 31 December 1916. He was the son of Wesley Harry Bagwell and Rhoda Manring.1,2,3 Edwin Doyle Bagwell married Mary Louise Batey, daughter of William A. Batey and Mary Jessup, on 14 November 1939.4,5 Edwin Doyle Bagwell died on 24 July 1975 at age 58.1 He was buried on 26 July 1975 at Greenlawn Cemetery, Kokomo, Howard County, Indiana. Lena Olive Ball was also known as Olive Bagwell.1 She was born on 11 October 1893 in Howard County, Indiana.1,2 She was the daughter of Amos Ball and Isadore Whitley.2 Lena Olive Ball married Clarence Elsworth Bagwell, son of Milton Archabold Bagwell and Dora Belle Olwin, on 11 October 1914.1,2,3 As of 1914,her married name was Bagwell. Lena Olive Ball died on 29 May 1979 in St. Jospeh's Memorial Hosptal, Howard County, Indiana, at age 85.2 She was buried at Greenlawn Cemetery, Howard County, Indiana. 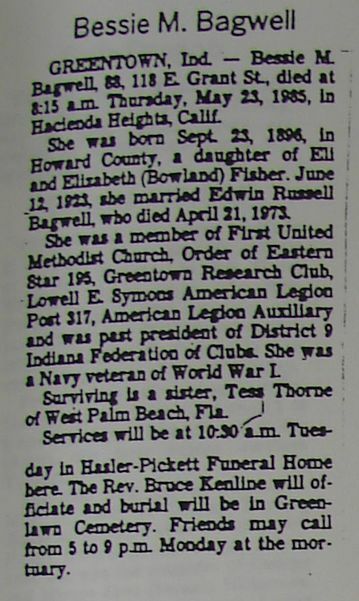 Sarah Alice Bagwell was born in 1915 in Indiana.1 She was the daughter of Clarence Elsworth Bagwell and Lena Olive Ball. Sarah Alice Bagwell died in 1930 in Indiana. She was buried at Greenlawn Cemetery, Greentown, Howard County, Indiana. 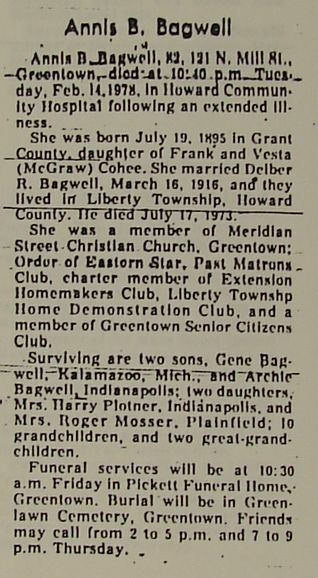 Ruth Delight Bagwell was born on 23 March 1917 in Howard County, Indiana.1 She was the daughter of Clarence Elsworth Bagwell and Lena Olive Ball.2 Her married name was Littlejohn. Ruth Delight Bagwell married (?) Littlejohn.2 Ruth Delight Bagwell married John William Littlejohn on 24 March 1945 at Grosse Ile, Wayne County, Michigan. Ruth Delight Bagwell died on 24 June 1985 in Palm Beach, Florida, at age 68. Chester A. Bagwell was born on 15 May 1919 in Greentown, Howard County, Indiana.1 He was the son of Clarence Elsworth Bagwell and Lena Olive Ball.2 Chester A. Bagwell married Lois Alberta Gordon on 26 December 1941. Chester A. Bagwell lived in 1979 in Phoenix, Arizona.2 He died on 6 March 2015 in Scottsdale, Maricopa County, Arizona, at age 95. He was buried at Green Acres Memorial Park, Scottsdale, Maricopa County, Arizona. 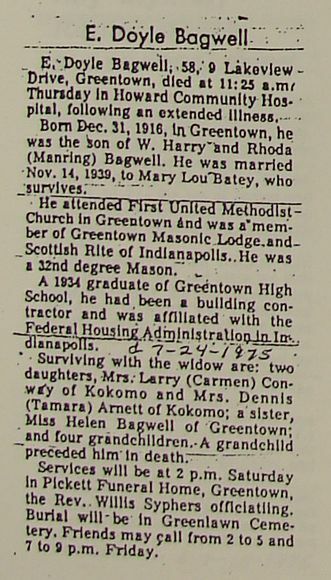 Blaine Greentown Bagwell was born on 17 August 1921 in Greentown, Howard County, Indiana.1 He was the son of Clarence Elsworth Bagwell and Lena Olive Ball.2 Blaine Greentown Bagwell married Bonnie Redinbaugh on 24 March 1940. Blaine served his country as a Marine from 1944 to 1946. Blaine Greentown Bagwell lived in 1979 in Greentown, Howard County, Indiana.2 He died on 31 March 2012 at age 90 Blaine Bagwell, 90, Greentown, passed away at his home 8:30 a.m. Saturday, March 31, 2012. He was born Aug. 17, 1921, in Howard County to the late Clarence and Olive (Ball) Bagwell. Blaine was a 1939 graduate of Greentown High School. On March 24, 1940, he married Bonnie Redinbaugh, who survives. Blaine served his country as a Marine from 1944 to 1946. Blaine retired from Delco Electronics as a pipefitter in 1986 after 21 years of service. Over the years Blaine worked at Rocky Johnson Plumbing, with Keith Carr as a plumber and pipefitter, at General Electric, at Globe American Stove Co., and also farmed for several years. Blaine and his wife had the Gift Shop in Greentown from 1958 to 1968. He enjoyed taking care of his yard and flowers, fishing and hunting mushrooms. He was a loving husband, father and grandfather, and over the years he and his wife shared their home with family and others who needed a place to stay. In the last four years, he gave his life to Jesus, and was prepared to meet him at his passing. He is survived by his wife, Bonnie Bagwell; his children, Brent (Rosie) Bagwell, Villa Victory, Mexico, Belinda (Richard) Sezbenski, Kokomo, Benita (Stan) Zirkle, Greentown, Beth Jaenicke, Greentown, Brad (Karla) Bagwell, Greentown, and Bart (Lisa) Bagwell, Nixa, Mo; a brother, Chester (Lois) Bagwell, Phoenix, Ariz; a brother-in-law, John Littlejohn, Fort Myers, Fla; grandchildren, Kim Bagwell, Winnie, Texas, Kurt Bagwell, Fallon, Nev., Kelly (Kevin) Toups, Winnie, Texas, Blaine Bagwell, Winnie, Texas, Erika Bagwell, Mexico, Bryce (Cynthia) Higgins, Indianapolis, Heath Higgins, Peoria, Ariz., Lori Zirkle, Carmel, Ryan (Kristi) Zirkle, Greentown, Trisha (Tony) Pironello, Kokomo, Jessica Jaenicke, Charlotte, N.C., Rebekah (Jeremy) Hill, Fort Wayne, Chris (Roxanne) Bagwell, Nashville, Tenn., Erin Bagwell, Greentown, Summer Wilson, West Lafayette, Andrew Bagwell, James (Courtney) Bagwell, Timothy Bagwell, Philip Bagwell, and Elizabeth Bagwell, all of Nixa, Mo; great-grandchildren, Bianca Bagwell, Amy Hamilton, Ashley Bagwell, Zach Bagwell, Kearston Weisse, Wasey Weisse, Kylor Weisse, Michayla Weisse, Brittanne Bagwell, Lily Bagwell, Morgan Wideman, Conner Zirkle, Gwyneth Zirkle, Emerson Pironello, Brianna Bagwell, Brody Bagwell, Clay Bagwell, Cole Bagwell, and Alexandra Bagwell; six great-great-grandchildren; and nephews, Steve Bagwell, Keith Bagwell and John Littlejohn Jr. He was preceded in death by his parents; children, Brenda Bagwell and Bryce Bagwell; grandchildren, Jennifer Bagwell, Jeremy Bagwell and Alice Bagwell; and two sisters, Sarah Bagwell and Ruth Littlejohn. Services are 10:30 a.m. Thursday at Hasler and Stout Funeral Home, Greentown, with Pastor Randy Blankenship officiating. Burial will follow in Greenlawn Cemetery, Greentown, with military rites by the American Legion. Friends may visit with the family from 4 to 8 p.m. Wednesday at the funeral home. Memorial contributions may be made to VNS Hospice with envelopes available at the funeral home. Messages of condolence may be left online at haslerstout.com. He was buried at Greenlawn Cemetery, Greentown, Howard County, Indiana. Steven Bagwell is the son of Chester A. Bagwell and Lois Alberta Gordon.